NEMO Disco 15 Sleeping Bag is an innovative design with several unique and patent pending features, with a down fill, and a great temperature rating. Nemo Men’s Disco 15-Degree Insulated Down Sleeping Bag. Here you have a mummy style down-insulated sleeping bag of a particular type. You will see below what makes it so specific. Size-wise, the bag is built in two sizes R and L, and those fit people up to 6 ft (183 cm) for the R size, and 6 ft 6 in (198 cm) for the L size. Note that the actual lengths are quite different, so you have 78 inches (198 cm) for the R size, and 84 inches (213 cm) for the L size. Seasons-wise, with the temperature rating of 15 F (-9 C) (and adding up some 10 degrees or so to this as usual), this is a 3-season bag, so I would not go to extremes with it. Note that such an official rating is usually in the middle between comfort and extreme which they also give sometimes, this is why I suggest adding a few degrees. Weight-wise, with 2 lb 11 oz (1.22 kg), this bag may not look so lightweight to be used by hikers and backpackers. A much lighter option would be this Mountain Hardwear Ratio 32 bag, but bear in mind the difference in their temperature ratings. Note also that it is slightly heavier than the Ramsey 15 bag from the same brand, and its packed size is also not so great compared with the Ramsey bag, it packs to 18 x 9 inches (46 x 23 cm). I mentioned some specific features, and some are patent pending, so here they are. 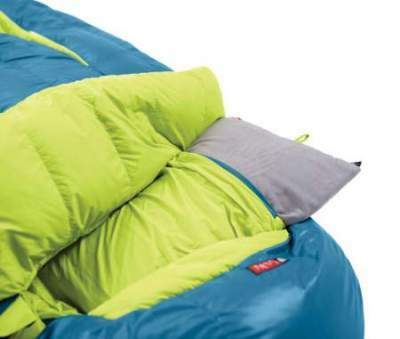 This is something for those who feel claustrophobic in a sleeping bag, see the picture above. I am one of them and every bag is too small for me. So the essence of this design is that it is wider where it is necessary, at elbows and knees, and you can move your knees up when you want to do so. You have 64, 60, and 64 inches (163, 152, 163 cm) girth in the elbow, hip, and knee zones, respectively. The design is particularly suitable for side sleepers and for those who need to have the legs bent sometimes. Now, to get some idea about the meaning of the numbers mentioned above, you can compare its knee and other girths with the width of the standard rectangular bag like the Teton Sports Celsius, where the width is 33 inches (84 cm). So you realize that the width is quite similar and you have lots of space here in this mummy bag. Compare it also with the NEMO Ramsey 15 where the knee girth is 53 in (135 cm), which is 28 cm smaller. This is a feature added to have when you need only moderate venting, so that unzipping the bag is not the best option. These two openings on the chest zone (see the picture) allow for some warmth release when you need it. So you have two zippers to regulate the temperature and to pass your arms through them if you need to check the watch or for any other reason. The same feature is in their Ramsey 15 bag. Two Thermo Gills with zippers. This is an element added under the chin opening against the draft, so you can tuck it around your shoulders and neck when you need more warmth, or you can simply push it out when you want to cool the interior a bit. The shell fabric is 30D nylon ripstop DWR, and in the footbox you have 40D nylon ripstop waterproof OSMO DWR. The lining is 30D nylon taffeta DWR. The fill is 650 premium fluorocarbon-free, water-resistant Nikwax Hydrophobic Down. They write it is 100% Responsible Down Standard (RDS) Certified. If you are curious about the meaning, this is about ‘humane treatment throughout the supply chain’. They speak about dacks of course. The down is treated, and they claim that it absorbs 30% less moisture and it also dries 60% faster than an untreated down. I guess this is so up to some point, I would rather keep the down out of moisture if possible. But this is not possible in some situations. 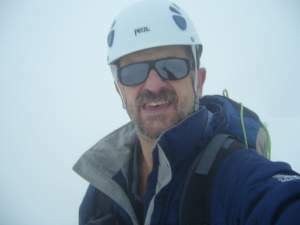 I have experienced it in the Alps when spending the night at very high elevations and when the pressure drops and clouds come, everything becomes wet, you are in the cloud and the vapor condensates on everything. The bag comes with an integrated pillow pocket. So here you can use a real pillow or just put your clothing and make a pillow on-the-go. You also have a small zippered pocket for small items located on the left close to the main zipper. You can see these two elements in the pictures below. Note that this Disco bag for men and the corresponding Rave 15 bag for women are designed so that they can be zipped together. The zippers do not go to the bottom, so you still have separate foot boxes. The zipper is located on the left side. The bag comes with a stuff sack, and a cotton storage bag to store it at home uncompressed. The stuff sack is without compression straps, I find this bad, you cannot compress the bag as much as you want and reduce the volume; note that you have them in the NEMO Ramsey 15 bag. The baffles are longitudinal and here you have internal flow gates that prevent the down from moving along the baffles, but the warmth will pass. Very spacious for a mummy bag. Can be zipped with other bags. There are no compression straps on the carry bag. Minimum weight R: 2 lb 11 oz (1.22 kg). Minimum weight L: 2 lb 14 oz (1.30 kg). Packed size (L x D): 18 x 9 in (46 x 23 cm). Length R: 78 in (198 cm). Fit R: up to 6 ft (183 cm). Fit L: up to 6 ft 6 in (198 cm). Knee girth R: 64 in (163 cm). Hip girth L: 60 in (157 cm). To better understand the features of this bag and to make an informed choice, it may be good to see how it compares with some other similar bags. So here it is with two others built in the same style. Observe that Kelty’s bag is heavier due to synthetic insulation and due to much stronger fabric, but the price difference is drastic. Please follow the links to read more. 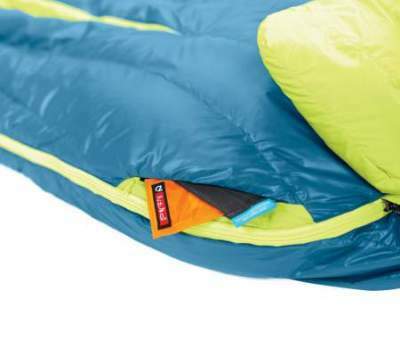 In the summary of this NEMO Disco 15 Sleeping Bag review, I wish to stress that they have built a nice bag full of useful features. This is an item for people who do not sleep like a mummy and who need some space for their knees. So this is a really comfortable bag and this is its best feature, my rating for this is the highest as you have seen above. This all comes at a price, the bag is expensive, but if you are annoyed with those standard narrow mummy bags, this is an item to try. It is light enough for shorter outdoor tours, and it is perfect for a 3-season camping at least as much as a sleeping bag can be. 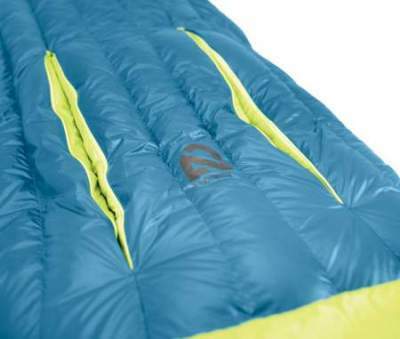 I have included it in my list of best 3 season sleeping bags. Note that they have a corresponding series for women under the name Rave. If you need to see some more options, please visit my page with bags, you will have plenty of items to choose from. This NEMO Riff 15 Degree bag is with the same features but with a better fill. If you need something ultralight, check this Big Agnes Hitchens UL 20 bag. A bag without a corresponding pad is useless, so check also the sleeping pads here. Please use the comment box below in the case of questions and comments. Have a nice day.